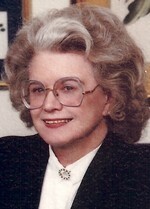 Mrs. Betty Brown Campbell, 83, entered into eternal rest on Jan. 30, 2010, at Levine & Dickson Hospice House in Huntersville, N.C.
Mrs. Campbell was born Betty Sherrill McDade on June 2, 1926, and was the daughter of the late Charles R. and Madge S. McDade. Betty worked as an accountant and retired to Brevard from Lutheran Family Services in Raleigh. An avid reader and traveler, Betty visited many foreign countries and every state in the Union except Hawaii. Betty’s love of travel led her to reside in many places throughout her life including Florida, California, Tennessee and South Carolina, but she always considered North Carolina her home, returning to Mooresville to be closer to her family. Betty was an accomplished pianist and was the organist for the First United Methodist Church in Troutman for many years. Betty was preceded in death by her first husband, James E. Brown, her second husband, Marvin E. Campbell, and her nephew, Charles David Nesbit. Betty is survived by her sister, Colleen M. Nesbit, of Troutman. In addition, she is survived by her nieces, Vicki N. Williams (Criss) of Columbia, S.C., and Tracy N. Grant (Jack) of Troutman, and nephew, Kelly M. Nesbit (Leanne) of Mooresville. She is also survived by great-nephews, Christopher D. Williams (Brooke) of Greenville, S.C., and Robert M. Nesbit of Charlotte, and great-niece, Rachel N. Shufelt (Brian) of Mooresville. She is also survived by five great-great-nieces and nephews. A memorial service celebrating Betty’s life will be held at 2 p.m. on Saturday, Feb. 6, 2010, at First United Methodist Church in Troutman with the Rev. Jack Wallace officiating. The family will receive friends immediately following the service in the church fellowship hall. In lieu of flowers, memorials may be made to First United Methodist Church, P.O. Box 717, Troutman, N.C., 28166.